This was a fun painting to do - full of bright color. Yellow is the color of sunshine and joy. These little orchids seem to be dancing with joy against a deep blue background. This original painting is #22 of the Tropicals Collection. The original watercolor is sold. 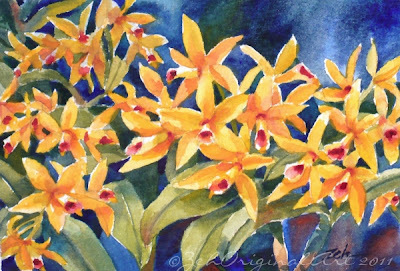 Find my available orchid paintings in my shop here: Orchid watercolor paintings. Thanks for stopping by and I wish you a joyful day!